Using pattern weights can be a great alternative to pins depending on the type of fabric you are using. Ashely Hough demonstrates how to make pattern weights using large washers and circles of fabric. Patterns weights can be fairly straightforward and easy to make as they only require metal washers, circles of fabric and a hand sewing needle and thread. The size and number of washers you use can depend on how big and how heavy you want or need to make the pattern weights. Ashley shows how to make pattern weights using two different sizes of washers. One of the washers is larger and only requires one per weight, while the others are smaller and multiple weights can be stacked together. Ashley explains that while you can use a washer by itself, not paired with others and not covered in fabric, it’s always a good idea to make a fabric cover for the washer so that it does not damage the fabric or get it dirty. Ashley shows how to cut a circle of fabric about 1” or so bigger than the washer. 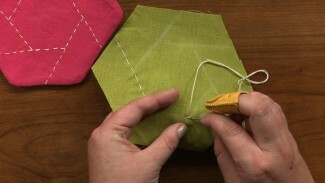 She then shows how to make pattern weights by folding the fabric ¼” towards the wrong side and hand stitching a running stitch along the edge. She demonstrates how you can load multiple stitches onto the needle and then how to insert the washers into the fabric circle and pull the thread tight. She explains that the fabric can be pulled all the way together in the middle or a small opening can be left. Check out more tutorials on tips for using pattern weights, including what some of the different fabrics are that you might want to use pattern weights for instead of pins and also see what some other custom pattern weights look like. You can also get more sewing tips and techniques on working with custom pattern weights, including ones that are flexible and allow you to easily weight down different shaped pattern pieces.